Dr. Ansar C. A. is a qualified practitioner in alternative medicine, and a registered member of the Indian Board of Alternative Medicines. 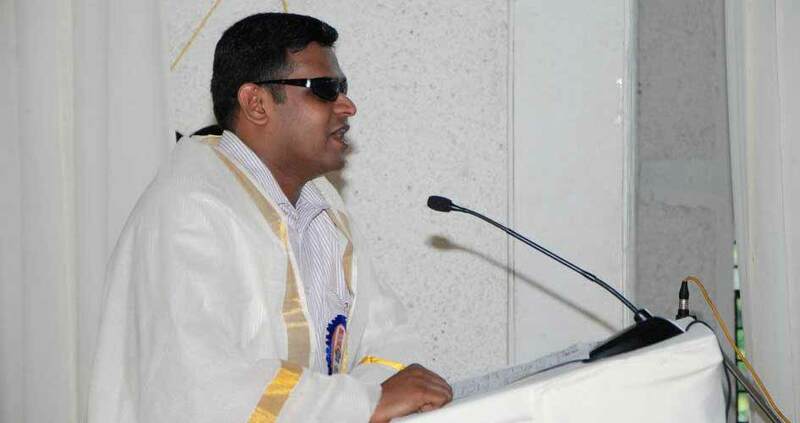 He studied at the prestigious Jayendra Saraswathi Ayurveda College, Chennai, where he trained in 'Panchakarma'. He learned Swedish massage, Zone Therapy, Sujok Therapy, Foot Reflexology from Mumbai and Yoga from Vyasa, Banglore. After obtaining his primary qualification in these areas, he underwent advanced training in Reflexology, Thai massage, Neck and shoulder massage and Aroma therapy in Thailand, and is now establishing himself as a leading practitioner in this field in Kerala. He had been awarded PhD in alternative medicine and Marma Shastra by the Open International University and achieved Masters in Yoga and Naturopathy. 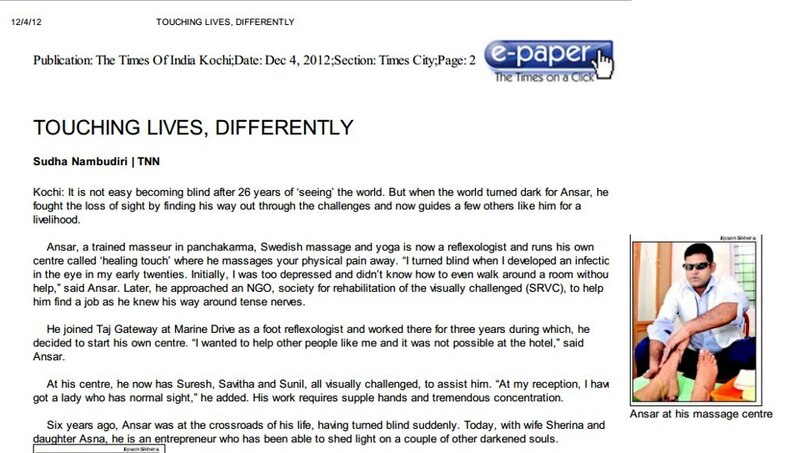 Dr. Ansar began experiencing failing eye sight in the year 2000, and by 2006, had completely lost his vision. Undaunted by this set-back, Dr. Ansar responded to it in a positive manner. He believes that his lack of vision, rather than being a handicap allows him a better focus on his chosen field of foot reflexology. He feels that in the absence of visual distractions he is able to concentrate better on the various pressure points that form very foundation of the science of foot reflexology. The lack of vision has only served to increase his sensory capabilities allowing him to seek out the pressure points with more precision and focus. It is also believed that certain therapies are performed better with the eyes closed for more concentration. Thus, the handicap has proved to be a blessing in disguise for both the therapist and the client, with the latter enjoying absolute privacy of attire while foot reflexology is being performed. Dr. Ansar had conducted his practice at the Gateway Hotel Cochin (formerly Taj Residency) for a period of two and half years, before setting up his own well appointed clinic at Vyttilla, where he currently attends to patients Monday through Saturday from 10.00 a. m. to 5.00 p.m. He has a large clientele, including celebrities from various fields, corporate heads and prominent members of the society who have experienced the positive feelings of wellness from his treatment sessions. Articles and features on him have appeared in dailies like Manorama, Indian Express, Deccan Herald, Hindu, Vanitha, Manoram Arogyam etc. among other publications.